Cloth has traditionally been woven in India by skilled weavers, on handlooms, and made into garments that are draped in the form of a sari or suit by women, and dhoti's by men. The textile tours of India take you to centres of traditional craftsmanship across the country. More or less every state in India is known for a particular indigenous textile of that state. The textile tours, one of the theme travel tours in India, tries to project the culture and art draped in handlooms in India. 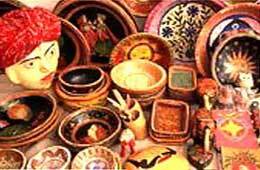 There are many craft traditions associated with textiles, such as mirror work, block printing, bandhani and tie-and-dye work done in Rajasthan and Gujarat. Punjab is known for its traditional floral embroidery called Phulkari work. Further North Kashmir is known for fine handmade embroidery in wool and silk, on woven woolen shawls and garments. Uttar Pradesh is famous for white embroidery on pastel cotton garments called Chikankari from Lucknow. In the east, Jharkhand, Bihar and Bengal are known for their hand woven textiles. Bihar, for its golden tussar silk weaving and Bengal for cotton Tangail, and silk Jamdani and Baluchari saris. 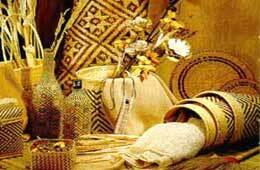 The seven Northeastern states are known for a range of tribal crafts including handloom shawls and clothing. In Orissa there are many different designs and motifs woven in cotton and silk to create the distinctive saris of Orissa - Bomkai, Teliarumaal, Sambalpuri which are cherished by women in India. Further up on the west coast, Maharashtra is known for its Paithani and Poona saris. Madhya Pradesh in the centre of India is known for its fine Chanderi and Maheshwari saris and Chattisgarh for its tribal weaving. Handloom weaving is an established traditional industry in South India. Andhra Pradesh has a rich weaving tradition, with Pochampalli and Venkatagiri being the best known. Tamil Nadu and Karnataka are known for their rich Kanjeevaram and Mysore silks and fine cotton saris and fabric in bright traditional colours. Kerala is known for its traditional off white hand woven clothing, with golden borders. Overflowing with colour, texture and designs, India's textile heritage waits to be discovered by you in a textile tour. Experience the wonders of India's textile tradition, with a textile tour of India.